The pure fun of classic American chocolate treats. The Chocolate Room has become a place of pilgrimage for chocolate lovers from near and far, thanks to its simple mission: to create treats that bring back those original childhood memories of the pure joy of chocolate. Its chefs have a knack for reconstructing a classic American recipe in ways that improve on the original. Their showstopping Chocolate Layer Cake, for instance, is the cake all other chocolate cakes dream of being; it’s made with a blackout pudding filling, three different kinds of chocolate, and a custardy ganache frosting. 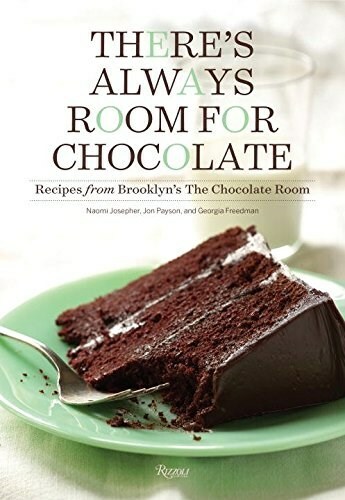 The book is filled with similar new twists that express the slightly irreverent and creatively whimsical spirit for which Brooklyn has become known: Chocolate Caramel Matzo, Chocolate Cuatro Leches Cake, and Chocolate Stout Gingerbread. Recipes reveal the secret tips behind signature favorites in every category from cakes and puddings to pies and cookies. Confections are geared to be achievable in the home: S’mores bars, Rocky Road mounds, and Cookie Chip Chocolates. The book also features informative primers on important techniques—including tempering chocolate, whipping cream and eggs, and assembling a cake. There’s Always Room for Chocolate is set to become the new essential cookbook for all things chocolate.